Berlin | and sure stars shining . . . In these darkest days of the year, we are surrounded by clouds of evil and forces of hatred. Zealots abound, both at home and abroad. When those zealots strike at someplace I’ve actually walked, where I have dined and drank, suddenly the hatred seems all the closer. The site of last evening’s attack in Berlin is one that I know, and in fact a place I visited on several occasion while staying in Berlin last year. E’en so, Lord Jesus, quickly come. We need no light, nor lamp, nor sun, for Christ shall be our all. This entry was posted in Daily Life, Episcopal Church, Travel and tagged Berlin on December 20, 2016 by Jeffrey Carter. This entry was posted in Travel 2015 and tagged Berlin, Europe, Prague on July 13, 2015 by Jeffrey Carter. So after our aborted Friday attempt to find the ‘Berlin Museum,’ we walked to and through the Brandenburg Gate, and then on over to the Reichstag. To ascend to the Reichstag dome, one either waits in line for timed-admission tickets that may be as much as two days later, or one emails and asks for a specific time. My email attempt received a standard ‘not available’ reply. So we went to stand in line. And so it was that after about 30 minutes this very nice young man walks up and starts pulling people from the line, and handing the immediate entry cards. I don’t know why, but he did. At about 7.15 p.m. Friday, after pictures on the front drive, I ascended to the roof of the Reichstag, and toured this stunning dome designed by Norman Foster. The video has the collection of photos I took, most of them looking outward toward the city of Berlin. I’ll also post another video from YouTube, looking inward. For both of us, this was the highlight of the trip so far! 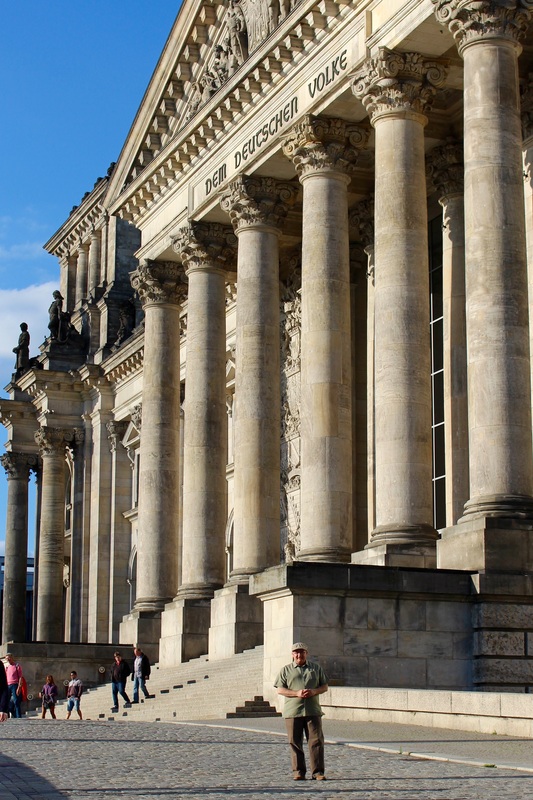 This entry was posted in Travel 2015 and tagged Berlin, Norman Foster, Reichstag on July 11, 2015 by Jeffrey Carter. This entry was posted in Travel 2015 and tagged #euroadventure2015, Berlin, walk like an Egyptian on July 9, 2015 by Jeffrey Carter. At 8.35 a.m., the sun has just broken through the clouds. We had rain overnight, pleting against the garret window in my top-floor bedroom. I’ve not heard that sound since I lived in Lawrence, Kansas. The clouds are moving rapidly from the west now, and we have promise of a somewhat sunny, but chilly, day here in Berlin. The plan for the day: collect our Berlin cards and use the hop-on, hop-off bus to become oriented; take the cruise on the River Spree; and go see things. Our bike tour of Berlin is set for Saturday. Dinner last evening was schweinebraten. I cleaned my plate. This entry was posted in Travel 2015 and tagged Berlin, Hackescher Markt on July 9, 2015 by Jeffrey Carter. Having arrived now safely in Berlin, here is an account of the day. We are in transit through Germany. First class on this train comes with a quiet cabin for four. We’re the only ones here, so we have spread out. K is napping across two seats. I am at the window seat on the other side of the cabin, watching the countryside whip by as the sky gradually lightens from the rain we saw leaving The Netherlands. Germany is green and healthy. Corn, not nearly as high here as back home, stands in small plots next to wheat fields. Green alternates with golden yellow. Little hedgerows set of expanses of land with houses on them. The train line is sided by tiny streams of water. Occasionally, off in the distance, a town is evident, marked almost always by a church steeple. Tall wind turbines are all about, but not in wind farms; rather, they pop up like sentries on the landscape, perhaps a kilometer or more apart. One thinks of Chinese watchtowers spaced in regular intervals on the Great Wall. Hanover must be near. I just caught enough of the German-language announcement to understand that the train is not stopping at Hanover Hauptbanhof, but at another station where those disembarking must take an S-Bahn (trolley, or overland light rail) to the main station. A poor American kid was terrifically lost in the cafe car today. He wanted a slice of pizza, and when he saw what the waiter pulled out of the freezer, he decided he didn’t want it. So . . . I hopped up and helped him order what he wanted, and while the pizza was in the super-oven, we chatted a bit. His father is an administrator at Pepperdine . . . they left California just after the school year ended . . . they are on a traditional grand tour with stops yet to go in Berlin and Prague and Vienna before Italy. I did my good deed for the day. And now, drama over, I shall relate a tiny story. Apparently the train is not stopping at Hanover because of an accident in Hanover that has caused the power lines (that power these electric trains) to fall. So we are taking a detour around Hanover, but not before a long, 30-minute stop outside of town. Suddenly the S-Bahn arrived from Hanover, and out emerged all of these excited Germans trying to figure out where they were going and how to get there. First Class was momentarily full until an announcement that a faster train was heading to Berlin at 2:18. And off they all went. I’m switching now from trying to understand Dutch to trying to understand Deutsch. All will be well. This entry was posted in Travel 2015 and tagged Berlin, Germany on July 8, 2015 by Jeffrey Carter. 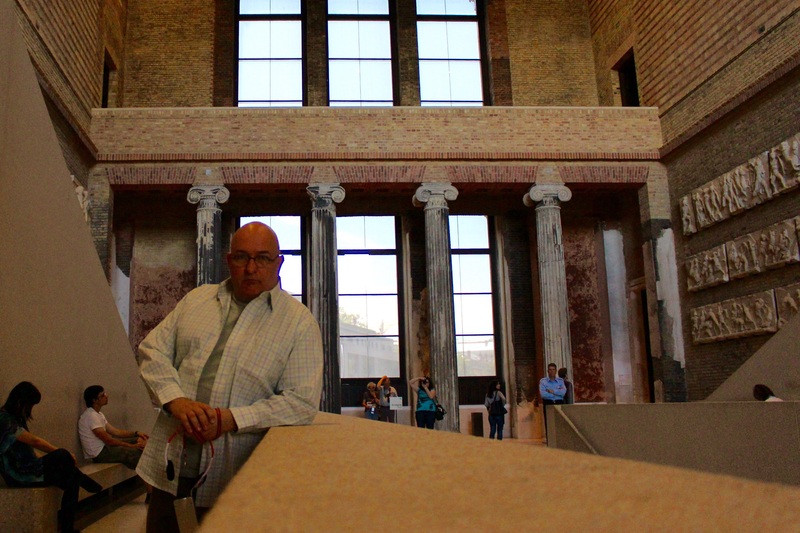 JC straddling what was West Berlin and East Berlin. I leave one month from today for this summer’s vacation in Europe. 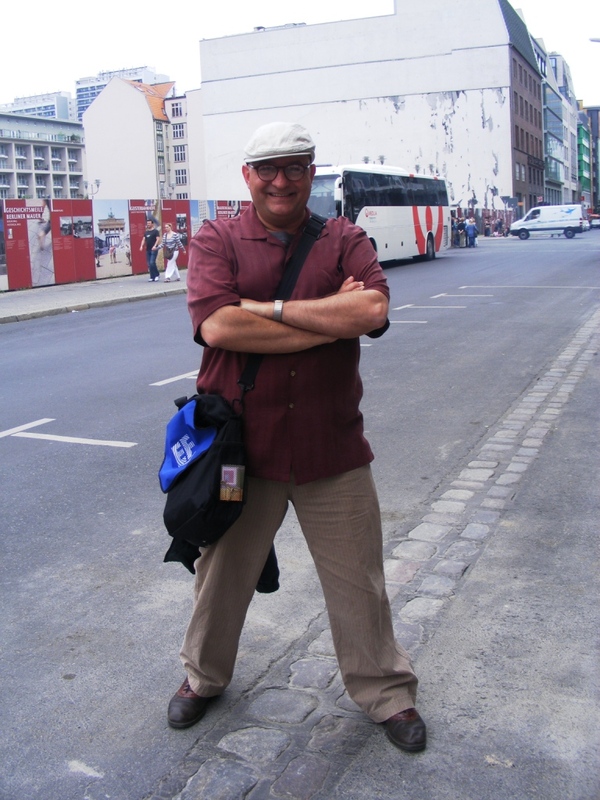 In prep for that trip, I have been re-reading blog entries and journals from my 2008 trip to Berlin, Potsdam, Wittenberg, Weimar, Dresden,and Prague. 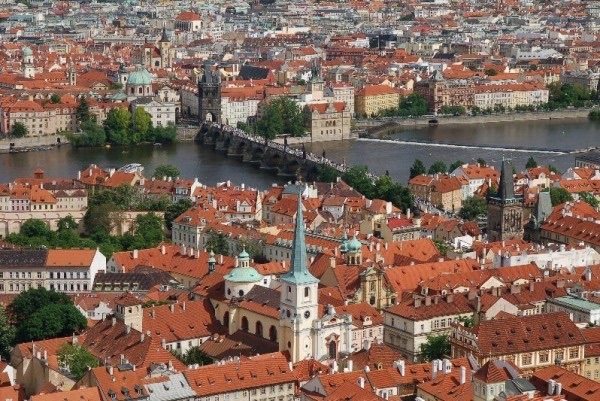 This entry was posted in Travel and tagged Berlin, Prague on June 2, 2015 by Jeffrey Carter.